The Franklin Sports wooden ring toss is a fun classic backyard game fit for all ages. Kids will learn and grow their cognitive abilities as they have fun with their friends and family. Players can make the game as easy or difficult as they wish! Simplify change the distance away from the toss target. This set is well made and designed to last for many years. 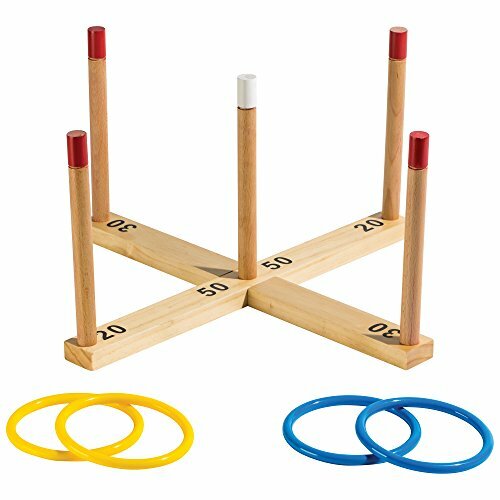 The wooden ring toss sets up in minuets and is ready to play within moments. STURDY base enables multi-surface play. Easy set up and no tools required! HOURS OF FAMILY FUN: Children and Adults love playing ring toss at tailgates, parties and barbecues. Makes a great gift! If you have any questions about this product by Franklin Sports, contact us by completing and submitting the form below. If you are looking for a specif part number, please include it with your message.